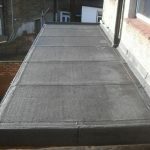 Flat roof in London, hints and tips! Choosing the right flat roof in London, tips and hints! The general consensus associated with flat roofs is normally one of worry and concern. Poor materials and shoddy workmanship are the common cause and root of the problem. Flat roofs have been around for as long as we all can remember, here in London you only have to look out of the window of the train or your own home and there are flat roofs are far as the eye can see. The question is, why worry. If a flat roof is undertaken by a competent contractor a flat roof can ​have a long life expectancy. A High end Reinforced Bituminous Membrane (3 layer felt system) is the most cost effective, tried and test system that when installed correctly has all of the following benefits, extended life-spans, ease of maintenance, proven resistance to the fluctuation of the British weather, together with high performance and cost effectiveness, a flat roof can offer a real alternative to a pitched roof. When installed and maintained correctly,. Contractor: Ensure your chosen contractor has completed the relevant training from the Membrane supplier. View previous flat roofs completed by the contractor and speak to past clients. Choose a contractor with the NFRC and Competent Roofer Scheme. Membrane: A good membrane is key. Whilst their primary purpose is to waterproof the roof area, they typically allow water to run off from a slight inclination or camber into a gutter system. Choose a system that offers an manufacturer’s warranty. Adequate falls: A flat roof needs to be able to clear surface water as rapidly as possible. The required falls may be formed by the slope of the joists. If not, then cut to falls insulation may be needed. Falls in the structure can be achieved by adjusting the height of the supporting beams or purlins, by using tapered supports, or by the addition of furring pieces before the deck is laid. U Value: Building Regulations dictate that certain U Values must be achieved for both new and refurbished flat roofs. The overall roof must meet the requirements of the Building Regulations with regards to the “U” value, and ultimately, this is down to the local Building Control Body (BCB) to make a judgement on what is required and what is acceptable. Remember you have to install insulation when replacing your flat roof, it is not an option it’s a requirement by Building Control. Luckily we can adhere and can help with all of the above, if you a flat roof in London that needs attention, require advice or some advice please give us a call.